Have I shared with you that I don’t really like meat and poultry all that much? It’s not even for ethical or health reasons. I just don’t enjoy the texture and flavor of animal protein. I was a pescatarian for about 8 years until I discovered I was slightly anemic, so I slooooowly started incorporating a little organic meat and poultry into my diet. Maybe I eat 3-4 ounces a few times per week, just enough to help me feel a little stronger. Before you think this is a post to convince you to eat animal protein, it’s not. I’m not here to tell you what you should and shouldn’t eat. Your body does an excellent job of that — you just have to listen. The fact is that the rest of my family enjoys all types of meat and poultry and so does the majority of my students and their brood. So I make sure I come up with at least one family-friendly meat or poultry recipe each month that I’ll enjoy, too. One of the few meat dishes I will actually eat a normal serving size of is meatballs. Is it that meatballs don’t completely resemble meat to me? Or perhaps I enjoy them because they are generally swimming in marinara sauce, which I do love. Regardless, meatballs are a favorite with many families and I had several requests for a turkey meatball recipe, so I gave it a go. Substituting turkey for beef is not always straightforward. Turkey doesn’t have the fat content or flavor that beef does, so I tend to use dark meat turkey and doctor it up a bit more by adding finely grated onion and fresh garlic. 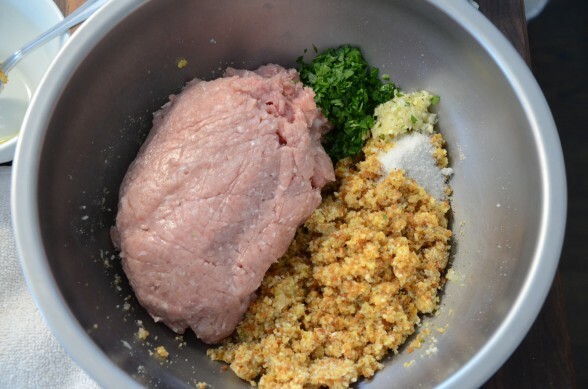 Many meatball recipes add turkey sausage to the mix to add flavor and moisture. You can do that, too, but I think it’s easier to just add 1/4 teaspoon of chopped dried fennel seeds to the mixture to get that unmistakable sausage flavor. My daughters and I really liked it, but Mr. Picky gave it the thumbs down and his father, who grew up Jewish, said it made him “uncomfortable” to eat something that tasted like pork. This is what I’m working with, people. Bread crumbs really do help keep the meatballs tender. I’ve used all sorts of bread here — spelt, gluten-free, a whole wheat onion hamburger bun. You can make fresh bread crumbs by putting fresh bread in the food processor and processing it until you get crumbs. Take those fresh bread crumbs and bake them in the toaster oven or regular oven for dried. Of course you can buy dried at the store, too. Bread-free? I have substituted COOKED quinoa one for one with the bread crumbs and they tasted great, but “leaked” a little while baking. I also tried rolled oats once and my family thought I was taking it too far. Rejected! Flavor boosters: Besides grated onion and garlic, I have used finely diced shiitake mushroom in place of the onion, chopped dried fennel seed, fresh basil and red chili flakes. Forming with your hands: Turkey meat can be sticky. Putting a little water or oil on your hands can help make shaping the meatballs easier. Baking vs. Frying: Baking will not give you the brown crust on the meat that frying does, but it is much more healhtful. Plus baking is 10 times easier to clean up! Round Balls: I have a thing against flat-bottomed balls. So I allow the meatballs to sit in the fridge for an hour and then my OCD kicks in and I reroll them before they go into the sauce, so I get perfectly round balls, just the way I like ’em. Shall we stop there? Preheat oven to 350 degrees if you’re going to bake the meatballs right away. Line a baking sheet with parchment paper. In a large bowl, beat eggs with onion, both bread crumbs and cheese. Add remaining ingredients and mix well until everything is well incorporated. 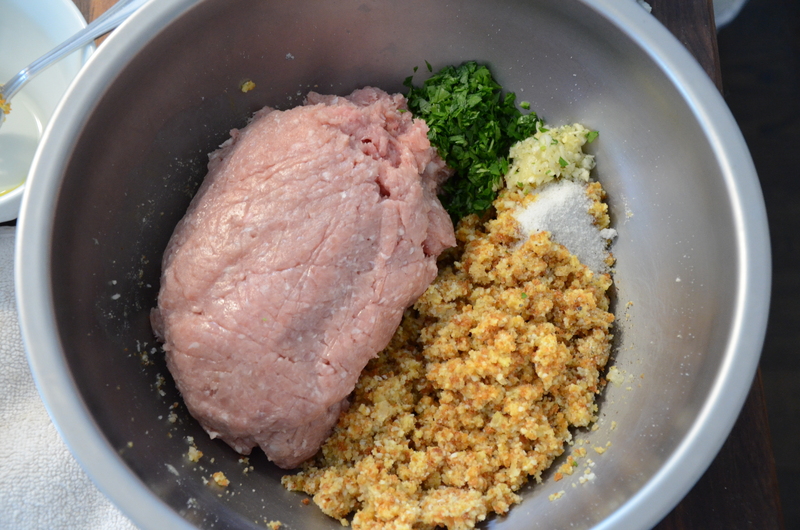 Gently (don't pack the meat) form mixture into meatballs with your hands. You can use a medium ice cream scooper to help portion out the same amount for each meatball. Place meatballs on prepared baking sheet. If you have time, place the sheet pan in the refrigerator for an hour or longer. Cover them if they will be in there longer. The meatballs hold their shape better if you can refrigerate them. In a medium saucepan, heat the olive oil over medium-low heat. Add the onions and sauté gently until softened, about 10 minutes. Add the garlic and cook another minute. Add the tomatoes and tomato paste with 2 generous pinches of sea salt and bring to a simmer. Cover the sauce and simmer for about 20 minutes. Taste for seasoning. 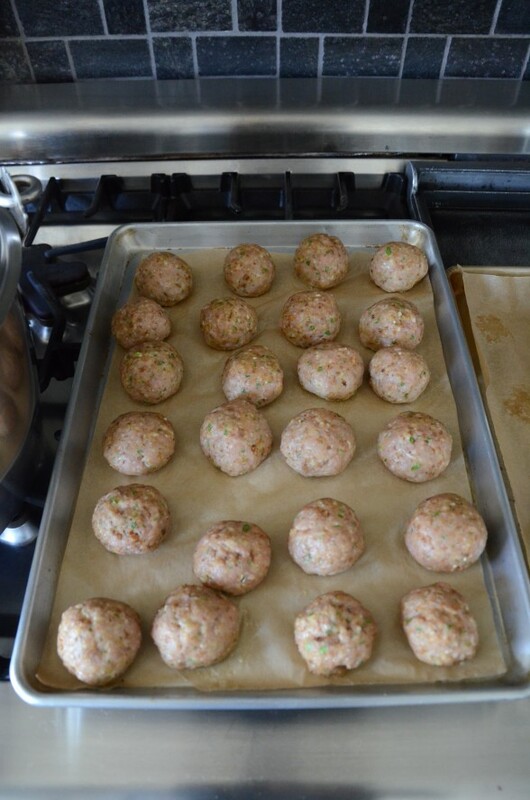 Bake the meatballs in preheated oven for 20 minutes or until barely cooked through. Puree about half the sauce with an immersion blender or pass through a food mill. Put the sauce back into the saucepan. Add the basil and simmer for another 2 minutes. 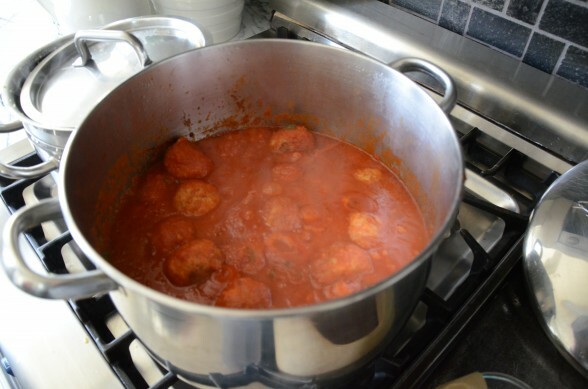 Add the meatballs, cover and simmer over low heat for 25 to 30 minutes until cooked through. Meatballs freeze incredibly well and come in handy for a dinner for one or school lunches since you can pull a few out of the freezer and reheat them in sauce really easily. For this reason alone, it's worth convincing your kids to take a thermos to school. Hi, we keep a kosher house so we can’t use cheese with meat. Could I replace it with some nutritional yeast or something else? If so, how much? You can leave out the cheese and add 1/4 cup nutritional yeast and add in a pinch of garlic powder and onion powder just to boost the flavor a little. You could also add in a little red or brown miso paste, but omit the salt. These look delicious. Would it work to use ground chicken instead of turkey? I made these turkey meatballs tonight – WOW. That was delicious. So simple and so flavorful. I have plenty for the week and froze half of them, too. I added shiitakes and a little basil as you suggested, and used gf breadcrumbs. Yum. I’m happy to have found these turkey meatballs. We make them all the time. Glad you made a bunch! Another huge hit from you! These were great and relatively easy to prepare. I served them over sautéed spinach and it went over well. I found gf stuffing cubes at Whole Food which I put in the vitamin to make breadcrumbs. I made these tonight, too!! I’m so glad you enjoyed them. I love the idea of the fennel seeds — makes it have a little of a sausage flavor. 🙂 Thanks, Monica! I have to tell you….there was a tiny bit of sauce left and some noodles and I had a little snack this afternoon. The sauce was even better today. I bought some more turkey today to make another batch and put in the freezer. I too use the Pomi tomatoes because they are the only ones that I could find that only had tomatoes in them. SO nice! I have to update the post re: tomatoes. I have since found Jovial organic tomatoes in glass jars. Love them! Are the Jovial tomatoes at Whole Foods or do you get them at Thrive Market? Thank you! Where I live, we have this little health food store called Roots and I looked in there today and they carry the Jovial Brand. 🙂 My mom lives by the Whole Foods in Bella Terra in Huntington Beach so when I am over visiting her I usually sneak over and get things I can’t find by my house. I found the meatballs lacking flavor – the texture of them was great though. The marinara was delicious. ideas? Ok well, you can add a pinch of red pepper flakes, more garlic, more cheese, more ground black pepper. You may like crushed fennel seeds. Hi Pamela! These were delicious! I love the idea of freezing them, but what’s the best way to freeze meatballs? With the tomato sauce? In quart containers? Or individually? Thanks! I like to bake the meatballs and then freeze them right on the baking sheet until frozen solid. Then transfer the meatballs to a covered container. By freezing them individually first, they won’t stick together in the container and you can use one at a time! Hey Pamela, is there a way to make this without cheese for kosher reasons? How would it taste? Would you substitute anything for the cheese or just take it out and do you still think it would be worth making? Sure, Rachel! I think you could omit the cheese OR sub some miso paste and drop the salt, OR sub a Vegan parmesan in its place. If i use beef..the ingredients are still the same? I haven’t tried this exact recipe with beef. My beef meatball recipe is slightly different. I’ll email you if you’re interested. Glad you like them, Marli! I used ground oats instead of bread crumbs. They came out amazing! I am so happy to know that! Thank you, Caryn! So I’ve made these twice so far and I have to confirm that they are excellent! I use gluten free bread crumbs in place of the regular and you can’t tell a difference. My 7 year old loves these so much that he asks me to make them for his lunch box!!! Thank you!!! You made the whole menu?! That’s fantastic! Such a pleasure when the kids gobble everything up :). Thanks for sharing — makes me happy. I usually substitute almond meal for breadcrumbs and my family has no clue! Delicious! I tried almond meal here, but I didn’t think they held onto moisture the way breadcrumbs do. But still a good option for those who want to avoid bread! Love the quinoa suggestion – have never heard that! How long should you bake the meatballs in oven if you are not finishing cooking them in sauce? Any adjustment you need to make if they have been refrigerated/ frozen? The quinoa idea was to accommodate students of mine who don’t eat bread. You really couldn’t tell until you cut into them and looked closely. If you are baking the meatballs and freezing them, cooking time stays the same provided you will finish them in sauce eventually. If you are never going to finish them in sauce, you need to cook them through, probably another 8-10 minutes. One you take them from freezer and drop them in sauce, just simmer them until they’re hot and cooked through in the interior — I don’t think I’ve ever added any additional time to what is on the recipe. I made these tonight for dinner substituting flax meal and water for the egg, as you suggested. They were absolutely delicious. Everyone loved them and I can’t wait to make them again and again. Although next time I will set aside some without parsley for my own 3-year-old mr. Picky who picked out all the “green”… Thank you!!! I’m so glad you wrote in. That’s terrific! The flax meal and water trick is a pretty effective binder. Side note — I know all about Picky boys and green things! 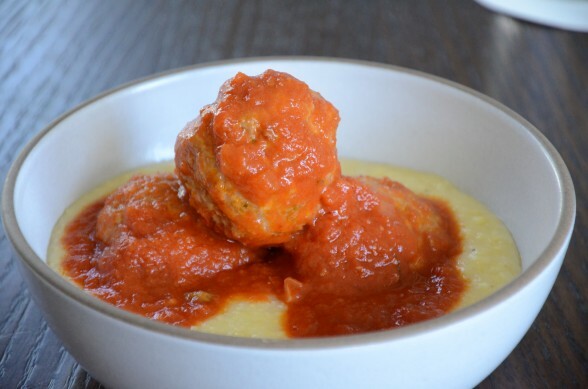 Sorry for not mentioning that the meatballs are on top of a bowl of polenta. Yum! Thank you so much for creating this recipe! I am not a big fan of meatballs. I love your turky taco dish and your turkey burgers. I am going to try this recipe out this weekend! Funny, because I don’t always love turkey versions of beef recipes because I think turkey’s too dry, etc. If you like my turkey burgers, you’ll love these, too. Great random comment! I had no idea. Thanks for writing in :).